A number of orientalists who have found the teachings of the Quran superior to human thinking, have spoken about the probability of the Quran’s adaptation from previous scriptures specially the Torah. They have cited numerous evidences to avoid admitting revelation of the Prophet Muhammad (PBUH) and to prove their claim. This paper aims to identify and explain this argument and answer it. Therefore, we will mention the comments of some persons who brought up this argument like: Montgomery watt; Bernard Lewis; Loot; Richard Bell and Yusuf Haddad. Then we will present ten answers to this argument. This paper demonstrates that none of the reasons of claimants can prove their claim. Divine religions originated from a single source and because of this the main essence of religions_ assuming they are free from distortion_ is the same. Existence of some simmilarities in Abrahamic faiths is irrefutable. These simmilarities are in the fields of theology, precepts, moral advices, anecdotes and stories. The perspicuity of the Quran in invitation of the followers of former divine faiths to some of common points is irrefutable. On the other hand, the Quran does not regard the revelation to Prophet Muhammad (PBUH) as an innovation or something new and unprecedented. It also refers that some subjects of the Quran exist in the ancient scriptures and the Books of the predecessors. These reasons have made some orientalists and Quranologists to believe that the Quran is a derivation of previous religions, especially the Torah and the Bible. Thus, some orientalists have tried to present some evidences and documents in this regard. In this article we will present the important points of these arguments and will review them. What is important in this review is the substantial difference between the teachings of the Quran, the Torah and the Bible. Sometimes, The Holy Quran explicitly challenge them and sometimes blamed those who considered Quran as a made of Prophet Muhammad (PBUH) or derivation of the early myths and legends of the ancients. 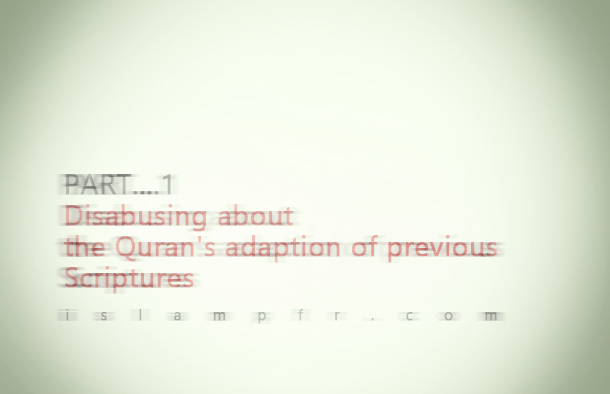 Firstly we will mention the viewpoints of some people about the derivation of the Quran. Yusuf Haddad, bishop and Christian priest, who is the most active orientalist in supporting the viewpoint of the Quran’s adaptation from Torah, wrote a book in three volumes on this case and according to his words he has researched for twenty years. He believes that Quran is identical to Torah, which he calls it “Al Kitab” and has been translated to Arabic language, and Prophet Muhammad (PBUH) has merely imposed some additions and amendments. Thus, Quran is not a new revelation and is not a new divine book and accordingly, Islam is not a new religion but the continuation of Moses’ religion. The supporters of this opinion are not limited to above-mentioned persons. Some others are: Tisdall, Massie, Andries, Lamens, Goldziher, Noldeke. (http://www.maref.ir) (“Quran and orientalism in the works of experts” Muhammad javad, Eskandarlu, 25/7/2010) The main proof of this doubt is numerous similarities which exist in the teachings of these two books and is regarded as undeniable similarity in the opinion of this group.